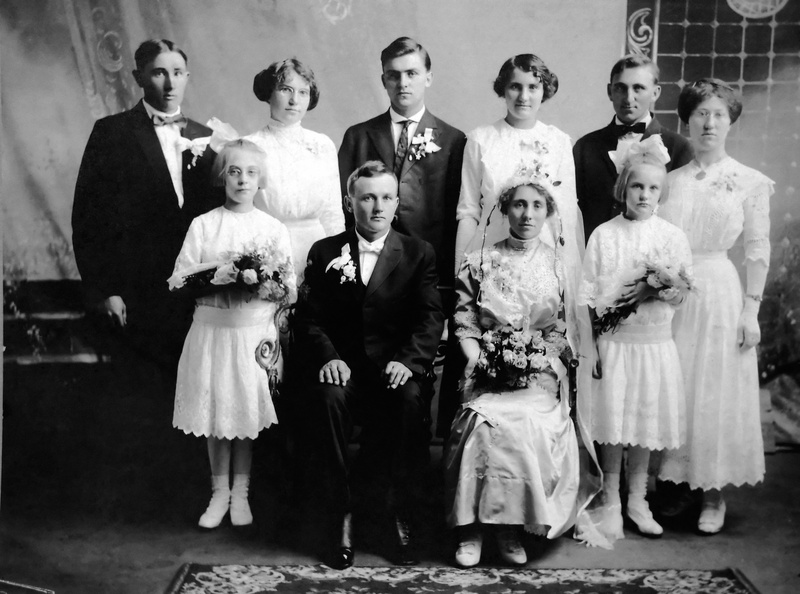 Judging by the turnout, the marriage of Joseph John Mras and Mary V. Sternot of the Town of Sigel in Wood County, Wisconsin, was the celebration of the year in 1913. The pair were married by the Rev. John Willitzer on October 21. The group portrait was taken outside the Sigel home of the bride’s parents, Jacob and Josephine Sternot. The reception had a big turnout from Sigel and the nearby village of Vesper. Groom Joseph Mras and bride Mary Sternot are flanked by flower girls Ruby V. Treutel (left) and Gladys Cole. Back row (left to right) includes Joseph Sternot, Josie Leu, John Pyrch, Anna Sternot, John Yeske and Mary Billiet. As with other large-group photos in our collection, it is fun to look for details in the sea of faces. Standing just right of center is my grandmother, Ruby V. (Treutel) Hanneman, who was a flower girl at the wedding. The bride and groom are tucked away in the upper right corner, looking a bit weary. The entertainers are in center front, one with a fiddle, one with an accordion and a third holding a pitcher of beer. Three things seem to link the men in the photo: hats, beer and cigars. Some things never change. A studio photo of the wedding party provides additional details on the big day. Ruby Treutel and (we believe) her cousin Gladys Cole were the flower girls, while one brother and one sister of the bride were also in the wedding party. Joe and Mary Mras had three children, Clarence, Earl and William. Joe was a crane operator for 31 years for the Frank Garber Iron & Metal Co. in Wisconsin Rapids. He retired in 1959. Joe died on April 10, 1961. Mary died September 20, 1977. Their son Clarence was killed in an auto accident in September 1956. Earl died October 18, 2001. William died February 18, 1997. — This post has been updated with corrected identifications on the wedding portrait. These are wonderful–almost like being there. Some things never change, do they?